Lawson is in the north-eastern part of Belconnen, bounded by Ginninderra Drive and Baldwin Drive. Lawson south is Territory land and is currently vacant except for some electrical infrastructure. 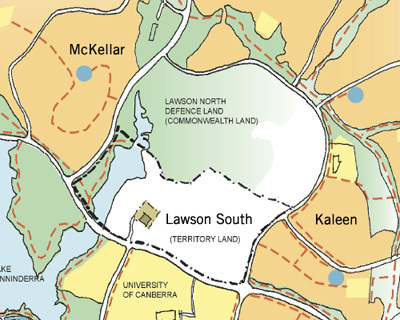 The northern part of Lawson, which is the site of the former Belconnen Naval Transmission Station, is owned by the Commonwealth Government and was not part of the Lawson planning study. The ACT Government engaged consultants in September 2008 to conduct a planning study for the future suburb to identify opportunities for urban development. After public consultation, EPSDD (former ACTPLA) endorsed the final planning study for the southern part of Lawson in August 2009. The vision for Lawson south is to achieve a liveable, sustainable ‘urban village’ that minimises impacts on the surrounding environment and maximises the positive attributes of the suburb. To achieve more sustainable development and residential choice, planning for Lawson south envisages a well connected, integrated and compact neighbourhood, where residential densities are higher than in surrounding established suburbs. Up to 1850 dwellngs are proposed. A draft variation to the Territory Plan (DV299) proposed to change the residential RZ1 suburban zone in Lawson south to a range of urban zones to enable higher density urban development, while protecting the area’s significant natural features and open spaces. DV299 will provide greater guidance for urban development at Lawson south through the introduction of more specific urban zones – including low, medium and higher density residential, urban open space, community facilities, commercial mixed use and transport.